Can you believe this streak of weather? 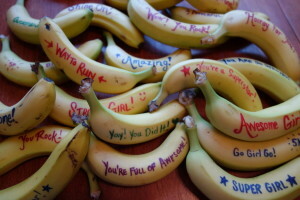 That’s right: I’ve spent the last hour buying and then writing inspirational messages on bananas. J and M have their Girls on the Run practice 5K after school today, and no one had claimed these refreshments as of this morning. But they’re cute, right? We’ve also all been spending a lot of time outside playing 2-Square or 4-Square. Only Cute W calls 4-Square “Daddy’s Home Square” because he’s a massive trash-talker. I vaguely remember playing 2-Square and 4-Square when I was a kid, but I can’t remember it being so complicated! Now, before someone starts, they might call “Bus Stop. . . Popcorn. . . Double Touch!” and I’m saying “What. . . ?” while the ball bounces between my legs. But whatever: it’s good clean family fun. When she’s not outside, one of M’s favorite hobbies these days is painting with nail polish. It’s funny, actually, because I remember that at Christmas she was interested in all sorts of rainbow colors of nail polish, and I was baffled. Because she never paints her nails. And of course, they were colors that I’d never choose, but I chalked that up to her being 12 and me being much older than that. Turns out, she has no interest in painting her nails. 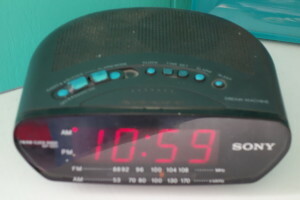 But her alarm clock is another story. She also likes re-vamping Altoid tins–cute! 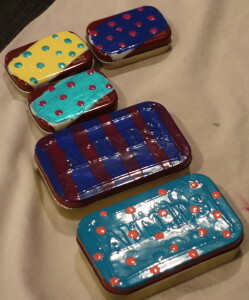 In fact, now I try to keep my mints hidden. Not only do the kids like to eat them, but they’ll gorge on them to get more raw materials for crafting. 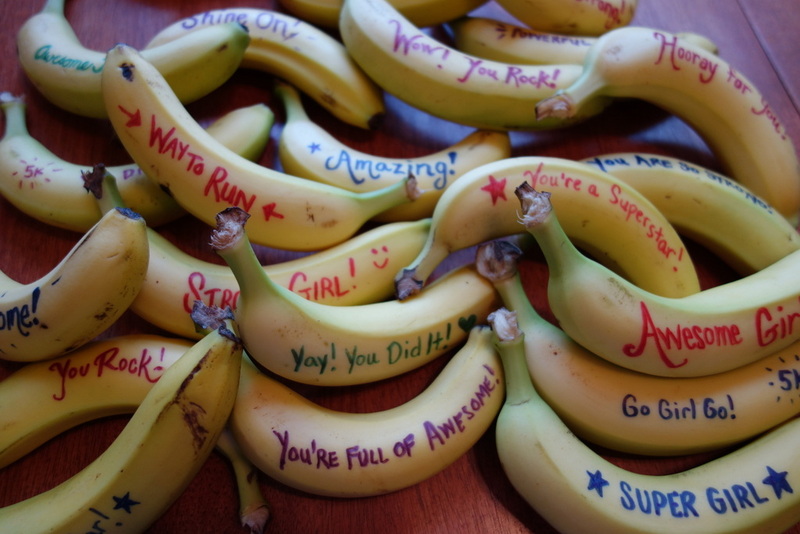 Maybe I should start getting them to paint bananas instead?